We all need a plant fix to get a jump start on our containers! 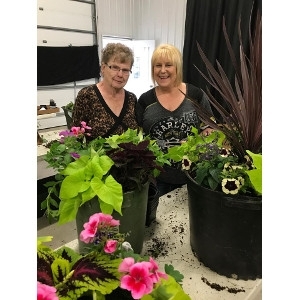 We had great classes last spring that created one of a kind planters! Best of all, we keep them in the greenhouse until the weather is good enough to set them outside! (Usually have you pick them up by Mother's Day). You will want to bring gloves, your container (you can do more than 1), and a hand trowel or rake if you like to use them while planting. April 22 is Earth Day, what a great way to make the planet better by planting some flowers! It's also Easter Monday, so if the kids don't have school, they can come along and help. Grab your friends for a great afternoon of fun!